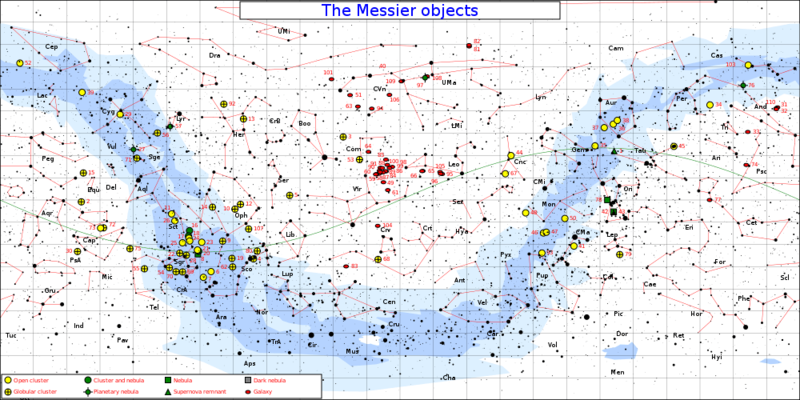 The Messier objects are a set of over 100 astronomical objects first listed by French astronomer Charles Messier in 1771. Messier was a comethunter, and was frustrated by objects which resembled but were not comets, so he compiled a list of them, in collaboration with his assistantPierre Méchain, to avoid wasting time on them. The number of objects in the catalog reached 103 during his lifetime but a few more thought to have been observed by Messier have been added by other astronomers over the years. A similar list had been published in 1654 by Giovanni Hodierna, but had no impact and was probably not known to Messier. The first edition covered 45 objects numbered M1 to M45. The total list published by Messier finally contained 103 objects, but the list “got an independent life” by successive additions by other astronomers, motivating the additions by side notes in Messier’s and Mechain’s texts indicating that either of them knew of the objects. The first such addition came from Nicolas Camille Flammarion in 1921, who added Messier 104 after finding Messier’s side note in his 1781 edition exemplar of the catalogue. M105 to M107 were added by Helen Sawyer Hogg in 1947, M108 and M109 byOwen Gingerich in 1960, and M110 by Kenneth Glyn Jones in 1967. M102 was observed by Méchain, who communicated his notes to Messier. Later, it was admitted by Méchain himself that this object does not exist, and it was simply a re-observation of M101. Some sources mention the galaxy NGC 5866 as an identification for M102. Messier’s final catalogue was included in the Connaissance des Temps for 1784 (published in 1781). These objects are still known by their “Messier number” from this list. Messier lived and did his astronomical work at the Hôtel de Cluny (now the Musée national du Moyen Âge), in France. The list he compiled contains only objects found in the sky area he could observe: from the north celestial pole to a celestial latitude of about −35.7°. Objects visible only from the southern hemisphere, such as the Large and Small Magellanic Clouds, were not observed or listed. The Messier catalogue comprises nearly all the most spectacular examples of the five types of deep sky object – diffuse nebulae, planetary nebulae,open clusters, globular clusters and galaxies – visible from European latitudes. Furthermore, almost all of the Messier objects are among the closest to our planet in their respective classes, which makes them heavily studied with professional class instruments that today can resolve very small and visually spectacular details in them. A summary of the astrophysics of each Messier object can be found in the Concise Catalog of Deep-sky Objects. Since these objects could be observed visually with the relatively small-aperture refracting telescope (approximately 100 mm, or four inches) used by Messier to study the sky, they are among the brightest and therefore most attractive astronomical objects (popularly called “deep sky objects”) observable from Earth, and are a popular targets for visual study and photography available to modern amateur astronomers using larger aperture equipment. In early spring, astronomers sometimes gather for “Messier marathons”, when all of the objects can be viewed over a single night.